Roseann has worked professionally for over 40 years as a business education and computer science instructor at high schools and colleges. She also owned and operated a computer business working with LLNL and Microsoft. After retirement Roseann developed an interest in creating jewelry. She began by studying gems and design. Roseann's style is largely traditional although she does experiment with different gems. She has done commissions making specific jewelry for groups. She has also taught at a senior center showing the members how to make jewelry. 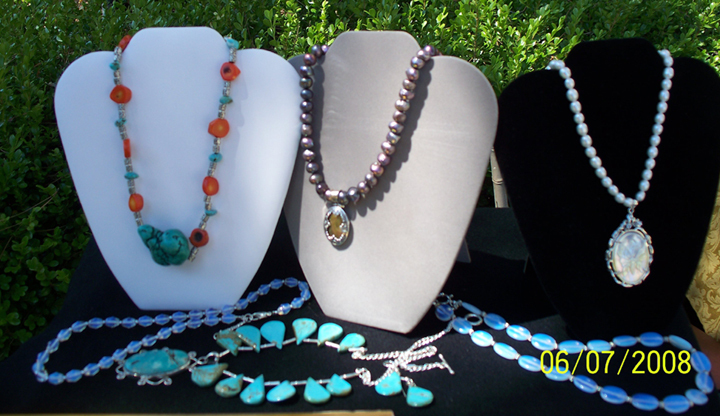 Roseann has shown her jewelry in the Bay Area over the last four years. Roseann attended college at Arizona State University and has a degree in Business Education. Her masters is in Business from CSU Los Angeles and her masters in Computer Science Education is from CSU Hayward. She is Web Master of the Alamo Danville Artists' Society and has been working with her husband in fine art. Walter S. Krane is also represented by the ADAS Blackhawk Art Gallery in Danville California, where you may find some of Roseann's jewelry. Email us to discuss your jewelry needs at rkrane@yahoo.com.